Mesut Ozil is set to be offered an escape route out of Arsenal with Inter Milan interested in bringing the German playmaker to the Serie A next summer. The 30-year-old has recently fallen out of favour with Gunners boss Unai Emery since the Spaniard’s arrival at the club earlier this summer. Emery suggested that he would leave Ozil out of tough away trips, seeing him relegated to the bench, but Inter reportedly want the former Real Madrid man at the end of the season. Ozil, who currently earns £350,000-a-week wages at the Emirates, will consider his options at the end of the campaign, according to The Sun. The Italian side had previously considered signing Ozil before he agreed to a fresh contract at the beginning of this year to stay at the club until 2021. However, things appear to have gone downhill since his contract renewal following the departure of Arsene Wenger. The former Germany international also had to miss out on Arsenal’s huge 4-2 win over Tottenham on Sunday due to suffering from back spasms. Ozil has started 10 league matches so far this season, and was captain for the four games before the win over Bournemouth last month. 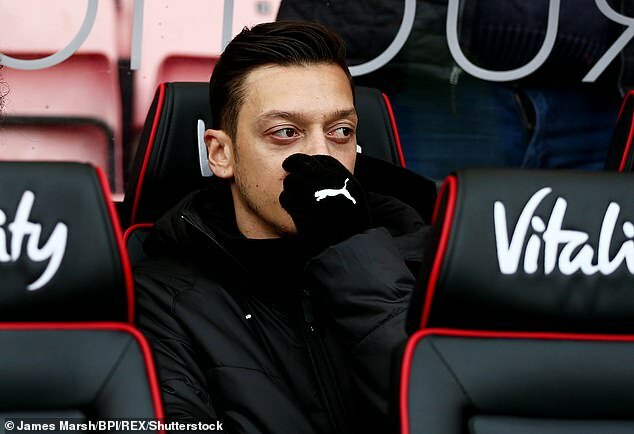 However, Emery suggested after the game that Ozil was not up to the challenge of playing Bournemouth.